Worry | If Not Now, When? Are you a worrier? That is a question I ask participants in my classes. Inevitably many slowly raise their hands, some blurt out, “Oh Yes!” “Are you kidding?” “Lifelong worrier.” Worrying in this day and age almost seems to be a requirement in order to get through the day, and often, we worry without even realizing we are. 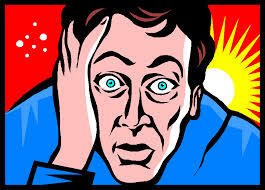 Worry is one of the symptoms of stress and is also one of the most destructive. I am going to take apart what worry is, why we worry, and what you can do…in your Traveler’s Notebook, to begin to stop worrying. If I were to ask you, dear reader, to tell me about your life, you would probably start with where you were born and go on to where you lived, who your parents are etc. To me, your life story would be a litany of facts, to you, your life is filled with vibrant experiences, emotions, passion, fear, anger, joy, love, maybe hate….all different emotions. As humans we assign emotions to the experiences of our lives. When I was in sixth grade we had to do a science experiment in class in front of everyone. My experiment was to show the class where the coldest part of a flame was. I mis-read the experiment and suffice it to say I lit the carpet on fire. I look back on that day with a smile, warm feelings about my sweet teacher and curiosity about what experiment I actually read and where it went wrong. If I had assigned shame or jealousy or anger or fear or guilt to that day I would probably still be worried about it. When we have negative feelings attached to past experiences…those are the ones that pop up in our worry book. Those are the ones we think about over and over again, wishing we could change them, do something different, change the course, we can’t….so remember that 30%, we will come back to it. 12% of what you worry about are medical concerns that won’t come to fruition. You wake up with an ache or a pain and think you are sick, your eye twitches and you are worried you have some thing wrong with it. If you have a concern, go to the Dr, don’t worry over it, fraught with fear that something is wrong. 10% of what we worry about consists of petty, miscellaneous details of our lives that do not warrant worry at all. If we were to tell our friends about these they may scoff and ask why we are letting such things take up our time. 8% of what we worry about are valid issues or concerns that are current in your life. They are active situations, people you are close to, projects at work….they have a legitimate place in your active thoughts! 1. Is this worry in the past, a medical issue, work related, related to a interpersonal relationship or a petty detail? 2. After you identify what it is, take a page and write about the worry, all of its components – emotions, people involved, events that took place, when they took place and the outcome. 3. If this is a past event with negative emotions tied to it, why? What are those emotions, what do you wish had happened that didn’t? How did things work out? How do you wish your part in the event was different? Is that valid? Can you talk to others involved in it and get their perceptions of your involvement? If not, journal about why you feel what you feel about the event and how can you change those feelings you’ve assigned to the event. 4. If this is a medical issue, why are you so concerned? Are you looking things up on the internet and scaring yourself? When can you go to the Doctor and address the issue? Why don’t you? 5. If this is a current, valid concern what are your action steps to address it so you can be proactive and quit worrying about it? Worry is something that becomes a habit. People who worry as a habit rely on it to give them the illusion that they are doing something when they really are just making themselves sick. If you are one of those people commit to the exercises in your TN, make them a priority and you can begin to let go of the things you worry about and create a more peaceful existence, a more positive life that is full of the joy of here and now and not the past or things that will never happen. This is part one in my series on stress. Part two will be coming up and we will be talking about the physical symptoms of stress and how to use your TN to address them.